Nauru and Manus Island: What the hell have we done? It’s true we don’t want a border policy that invites individuals to make the perilous journey to Australia via an illegal method. It has been well documented by the Australian government that thousands have drowned at sea attempting to reach the shores of Australia. We need border security – I am not questioning that – given that every nation has borders to protect their sovereignty. Proper border security allows individuals to be screened as nations do need to know who is coming into the nation for security purposes. My issue is with the attempt for a media black-out on Australia’s detention centres on Manus Island and Nauru, causing, we the Australian people, to have little knowledge of what our government is doing to these people. Why have they been so secretive? What is the Australian government hiding? Several reports and information leaks have suggested abuse on a large scale but coverage has been limited and restricted by the Australian government. Media visas for The Republic of Nauru currently cost $8000 per visa, the application cost is non-refundable if denied. Former employee’s of the Australian detention centres face two years in prison for discussing conditions on the islands under the Border Force Act, something which affected health professionals working on the islands as well. In the last two years a journalist from The Australian has been allowed to visit the island and Channel Nine’s A Current Affair (ACA) have also taken a film crew onto Nauru. The specifics of their visa approval conditions have never been released and critics of the team going onto the island suggested that although they believed ACA would do their best to cover the story they believed they would receive a guided tour of the facilities on Nauru. There has to be something said about the current Australian government being so adamant at keeping the media out and silencing those who have worked on both Islands. What is being hidden on these Islands, what doesn’t the Australian public know? What is occurring to these individuals who have been captured and taken to these detention centres? Why has there been numerous incidents of individuals detained on the island hurting themselves or staging small riots, are they simply angered by not making it to Australian shores or is there something more sinister at work in these centres? Ian Rintoul is one of the founders of Refugee Action Coalition (RAC) Sydney, Mr Rintoul is a well known activists for refugee rights in Australia and has been to Manus Island in recent times gaining an insight into just some of what is going on in Australia’s offshore detention centres and how it is affecting the detainees mental health. “The main thing that affects people’s mental health is the arbitrary quality of their imprisonment. They have committed no crime yet are treated worse than criminals,” said Mr Rintoul. The truth has been kept from Australian people the conditions these individuals face in detention is hidden, we’re mostly unaware of the situations these individuals face and it so hard to get information on what is actually going on inside both Manus Island and Nauru detention centres. “There is no definite end to their imprisonment. They are prevented from helping themselves, cut off from their families, often unable to assist their families who have been left in dangerous circumstances. Every aspect of their detention is designed to break them mentally,” said Mr Rintoul. The conditions and treatment of detainee’s has had a dramatic and damaging affect on the individuals held in Australia’s offshore detention centres. There has been numerous cases of self harm on both islands two cases from earlier this year. One male set himself alight, Omid Masoumali from Iran died from his injuries, within the same week on Nauru another refugee this time a female lit herself on fire, she survived her injuries. Ian outlines that there has been numerous individuals brought to Australia for medical and psychological treatment because of their total deterioration on the islands. “There are numerous incidents of self-harm on Manus Island. There have been attempts at self-immolation but thankfully they have not been successful but there are other ways that people have attempted suicide,” said Mr Rintoul. Small information leaks and investigations have heavily suggested that there has been abuse of the detainees perpetrated by the guards and other detainees on the islands, further increasing the situations traumatic affect on the people detained there. “The government is hiding the reality of the mistreatment and misery and the corruption for which they are responsible on Nauru and Manus Island. The 2000 files leaked to The Guardian had to be leaked because that information is not publicly available. But it records the scale of mental health breakdown, despair and assault that is the lived realty of asylum seekers on Nauru,” said Mr Rintoul. Ian pointed out that the government had become aware of the deterioration of the situation on their offshore detention centres. “The governments own Moss review of similar evidence given by Save the Children workers confirmed the reports of abuse were accurate,” said Mr Rintoul. A report by Amnesty International (AI) conducted between July and October this year on Australia’s offshore detention centres interviewed numerous detained people on the islands and individuals who had worked on the islands. The report was clear and open in condemning what had transpired on the islands, which supported much of what had already been claimed about what was really happening on the islands. “The Government of Australia has flouted the Refugee Convention, undermining its purpose and the values for which it stands by subjecting children, men and women who have sought protection in Australia to egregious abuses as part of the Government’s policy of offshore “processing” of people seeking protection,” said the AI report. “The abuses on Nauru have been facilitated by a deliberate policy of secrecy, again established by the Government of Australia,” said the AI report. This report and numerous other information leaks have placed pressure on the Government that could no longer be ignored. Only just this week the Government has outlined it will be amending its Border Force Act and the suppression of information from health professionals who worked on the islands, doctors and nurses can now reveal information in regards to the situation on the island without fear of imprisonment for up to two years as was previous policy. It has also been announced that the detention centre on Manus Island will be closing in the future as Papua New Guinean Supreme Court has found Australia’s detainment of these people illegal. 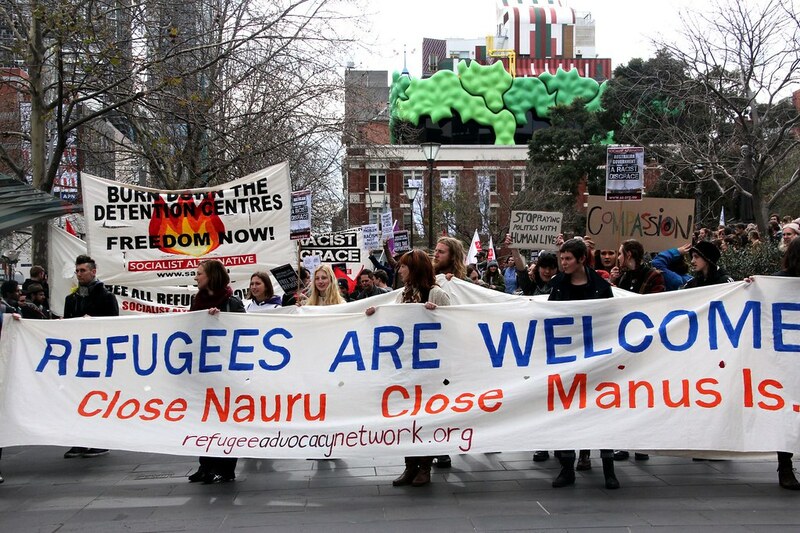 Refugees Activists March in Melbourne 2013.Credit: Takver, Flickr. The remaining nine hundred men on Manus Island will not be resettled in Australia, according to the Government. Maybe this is the end of Australia’s offshore detention centre shame, but how do we balance between border security and humanitarian sanctuary for those in need? I agree that the Government should be careful in inviting these individuals to Australia as it may invite further attempts by others via the sea, which is extremely dangerous, it is well documented how unsafe the journey is. We should avoid a system that invites people to take the dangerous journey to Australia via the ocean but, what then? The past, the present and the future: How the hell did we get here? The Labor Government from 2007 to 2014 was heavily criticized for dismantling some of the Howard governments tough illegal immigration schemes, the current Liberal government suggests that fifty one thousand illegal immigrants arrived by sea under the Rudd government following the Howard era. A quick snapshot from illegal boat arrivals in Australia since 1976 to 2013 suggests that this number is roughly accurate during the Rudd/Gillard years, the number before that was without a doubt significantly lower. 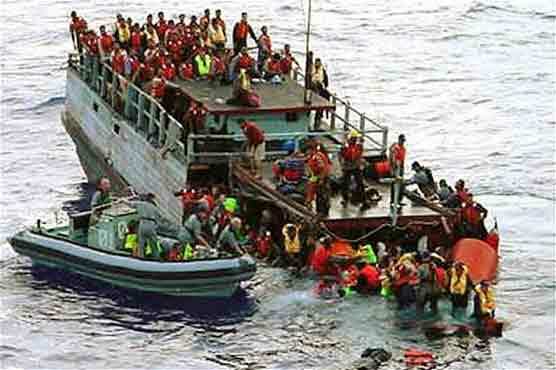 Under the Rudd and Gillard years with a more lenient illegal immigration system thousands poured towards our shores and it is documented that between 1000 and 1200 people drowned at sea, during that period of spiked migration via the illegal ocean routes. It is a hugely tough task that any government faces with illegal immigration in Australia, large portions of the Australian population want tough border security but when they hear of abuse and neglect of the individuals on the islands they turn against the current programs governments have operated under. Further information on Australians feelings towards illegal immigration can be found here. What has occurred over the past few years on Manus Island and Nauru is inhumane by global standards. A series of governments in-action and suppression of information of abuse on these islands will leave Australia with a history of shame and mistrust. Much of the information available suggests that the current government knew the abuse was occurring and that the people on the islands were suffering greatly, yet they attempted to hide it from the public. It would have been far more honourable and less messy affair to expose the abuse themselves and then take adequate action to improve the conditions and safety on the islands for all detainees. They have failed these detainees and they have failed the Australian people, we will be remembered as a nation for this. This will be remembered as a dark period in Australian history there is no doubt of that. The current government and next government must not only deter individuals from making the deadly trip across the ocean and insure border security, but they must ensure that those that do come are processed appropriately on Nauru and kept safe until they’re resettled to their new homes, which at this stage is being negotiated but which would appear to be a nation within South East Asia. As a nation, Australia must now try to repair the damage that has been caused because of the Nauru and Manus Island detention centres. The Australian media must do its duty and bring such inhumanity to light, divorcing itself from the suppression of the government. Please note, this opinion piece has been authored under the pseudonym, THE JUDGE, to protect the author from slander. As with all of our journalists, THE JUDGE’s opinions do not necessarily reflect those of The Source News. « Overpopulation: When is enough, enough?